More than 1000 years ago, Kingston was the place where England began. Before All Saints Church Church was built, its site was an important estate of the West Saxon Kings and host to Royal coronations. The Saxon King Egbert held his Great Council of 838 AD ‘in that famous place called Cyningestun’ and over the following centuries as many as eight Saxon kings were consecrated here. The most well-known of these Saxon kings was Athelstan, the first ruler who could truly be considered the King of England. After being crowned in Kingston in 925 AD Athelstan defeated the Scots and Vikings, unifying regional kingdoms into one nation. Kingston’s royal connections are first evident in the record of King Egbert’s Great Council in 838, which was held here. It is recorded as happening ‘in that famous place called Cyningestun’, the name denoting a royal estate, probably including a consecrated building, and suggesting that this was a ‘well-known’ place. The Council was attended by the King, his noblemen, the Archbishop Ceolnoth of Canterbury and other senior clergymen. At the meeting, the church and King formed a strong bond and allegiance with each agreeing to help the other. The archbishop probably anointed Egbert’s son Ethelwulf as the next king following Egbert. It has traditionally been claimed that seven Saxon kings were crowned on the site of All Saints, and we have good historic evidence that at least three were. Athelstan was certainly crowned in Kingston in 925, Edred in 946, Ethelred the Unready in 979. Other Kings believed to have been crowned here include Edward the Elder (900), Edmund (940), Edwy (955), and Edward (975). It is also believed by modern historians that Edgar was crowned in Kingston in 959. Although there is not enough evidence to say so with certainty, between three and eight kings were crowned at Kingston. The Saxon cross fragment still housed in All Saints formed part of a larger cross possibly erected to commemorate one of these coronations. The coronation stone which is still on display in Kingston is said to have been the stone which the kings sat upon whilst they were crowned. 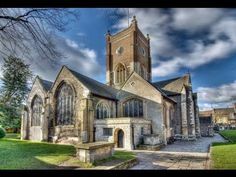 The most notable of the Saxon kings crowned in Kingston was Athelstan, grandson of Alfred the Great and first King of England. He was crowned here on 4th September 925 in a ceremony which laid the foundations for our modern coronation service. Athelstan first greeted his people in the marketplace before entering a church, which was probably wooden, and probably stood on the site of our present All Saints Church. Athelstan was the first King to be ordained with a crown placed on his head, rather than a helmet. For the first time the coronation service laid out the responsibilities the king and his people had to each other, and the Christian hymn Te Deum was sung as it is now. The coronation ‘ordo’ compiled for Athelstan was used for subsequent coronations through to the coronation of our Queen Elizabeth II in 1953. Athelstan went on to become the first true King of England, as it was during his reign that regional kingdoms were united as one nation. As King of the English from 927, he was the first English king to conquer northern Britain. Athelstan was a particularly successful soldier and defeated a combined army of Scots and Vikings at the battle of Brunanburh in 937. Although a millennium has passed since the coronations of the Saxon kings at Kingston, the ‘coronation stone’ remains on display in the town outside Guildhall, and is due to be returned to All Saints’ churchyard. This sarsen stone was probably recovered from the ruins of St Mary’s Chapel next to All Saints, and by 1793 The Ambulator, a guidebook to London, was reporting that it was the stone on which the Saxon kings sat while being crowned. This tradition, which culminated in the stone being mounted on a plinth and surrounded by railings in the market place in 1850, is now itself an important part of Kingston’s history.